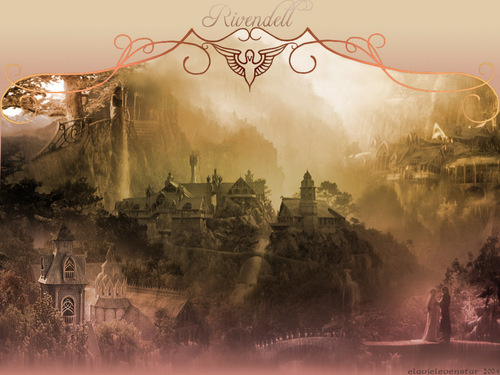 Rivendell. . HD Wallpaper and background images in the द लॉर्ड ऑफ द रिंग्स club. This द लॉर्ड ऑफ द रिंग्स wallpaper contains व्यापार जिले, शहर, व्यापार जिला, and डाउनटाउन. There might also be इंद्रधनुष, फव्वारा, and गगनचुंबी इमारत. Beautiful! Love the border/mask esp. i LOVE these wallpapers. it has been so hard for me to find semi decent non- pixelated ones. i especially cant pick between characters so love the idea of places. ikr!i especially like the ones of Elijah wood!